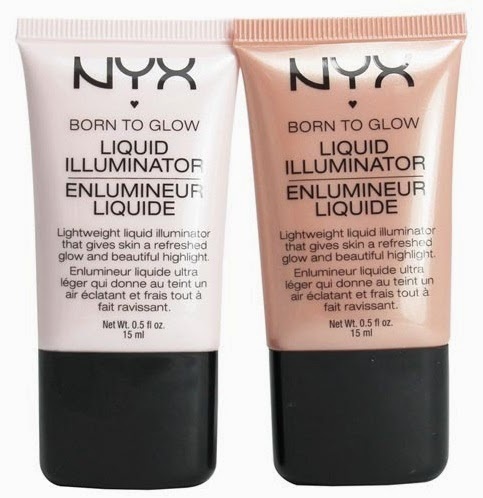 Make Up For Dolls: NYX Born to Glow Liquid Illuminator - preview & giveaway! 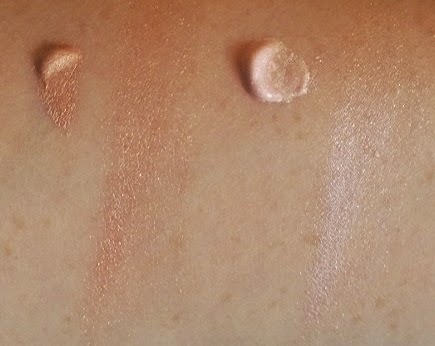 NYX Born to Glow Liquid Illuminator - preview & giveaway! NYX have two shades, #01/Sunbeam and #02/Gleam. #01 is your silvery-toned palest-of-pale pink version, suited to paler and colder skintones, and #02 is your golden-peach-toned version, more suited to darker and warmer skintones. Ingredients-wise, these are water- and silicone-based, they do also contain parabens, mica, titanium dioxide and/or iron oxide. Lots of reflective stuff going on there. Likely these are going to suit younger skins better, as they're very slightly sparkledy underneath the shimmer, these retail around the €9.49 mark for 18ml, which makes them a very affordable option, and - best of all - come in a nice simple squeezey tube, nice and usable and sanitary. Look here for more info if you're interested. Courtesy of the lovely folks at NYX, I have one of each of these to give away to two lucky readers. All you've got to do is (1) like and share on Facebook and/or tweet on twitter AND comment below, letting me know if your preference is for the Sunbeam or the Gleam shade. As per usual, I'll let the competition run for a week and then draw two names out of a hat. Competition is open to all readers, anywhere in the world. Good luck, and thanks for reading as always!